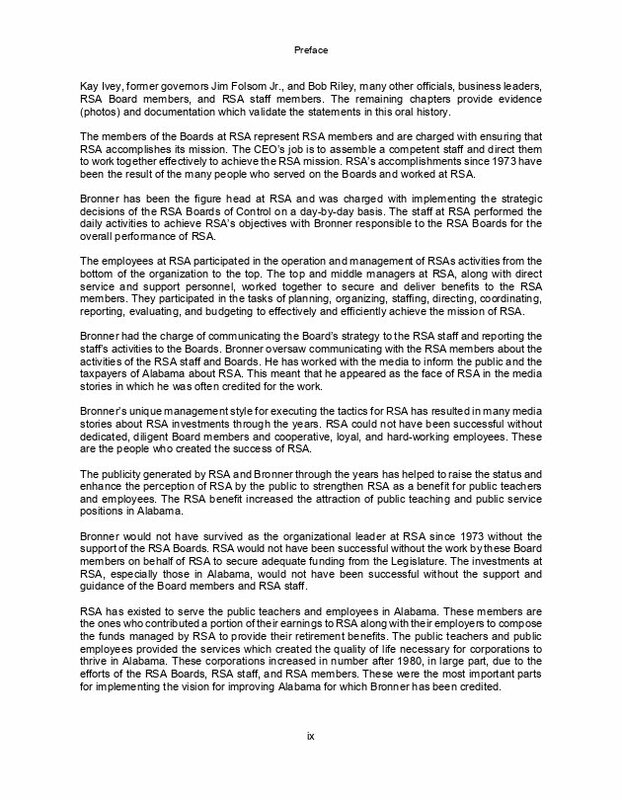 The pension fund is the Retirement Systems of Alabama (RSA) which manages pensions for 358,000 public teachers and public employees. 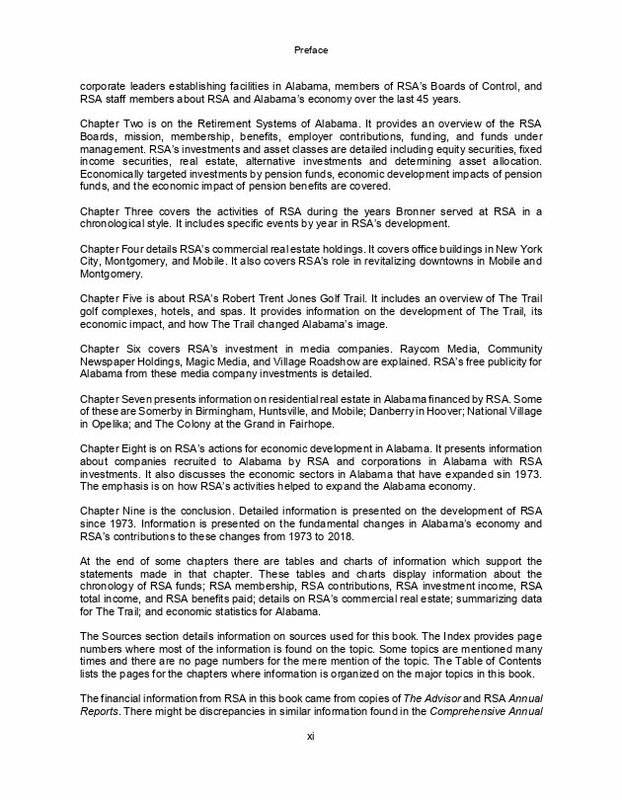 This book tells how RSA grew assets and helped expand Alabama's economy through RSA's investments and industrial recruitment for the state. 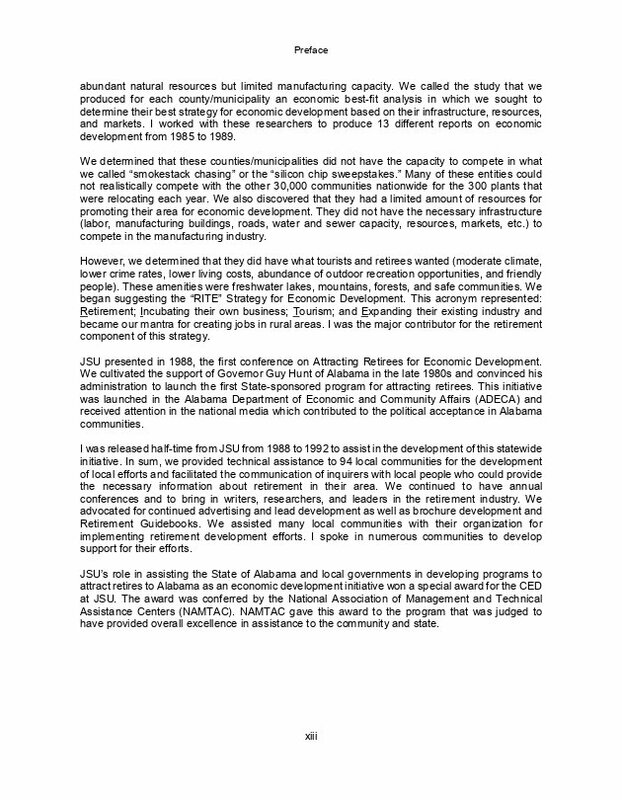 The Oral History chapter includes statements from President Trump, US Senator Richard Shelby, Alabama Governor Kay Ivey, former Alabama governors Jim Folsom Jr. and Bob Riley, retired Alabama Supreme Court Associate Justice Janie Shores and retired Chief Justice Sue Bell Cobb, US congressmen Glen Browder and Jo Bonner, industrial developers Billy Joe Camp and Elmer Harris (Mercedes-Benz), corporate executives locating facilities (Airbus, IPSCO, Bell Micro) to Alabama, and many others. The remaining chapters provide photos and documentation which validate these statements. RSA' funds under management grew from some $600 million in 1973 to $43.8 billion in 2018 while earning $52 billion in investment income and paying $51 billion in benefits. RSA's most famous investment is The Robert Trent Jones Golf Trail with its 26 golf courses and 8 resort hotels. RSA's other alternative investments were in 65 TV stations, 125 newspapers, and 15 buildings in Alabama and New York City. 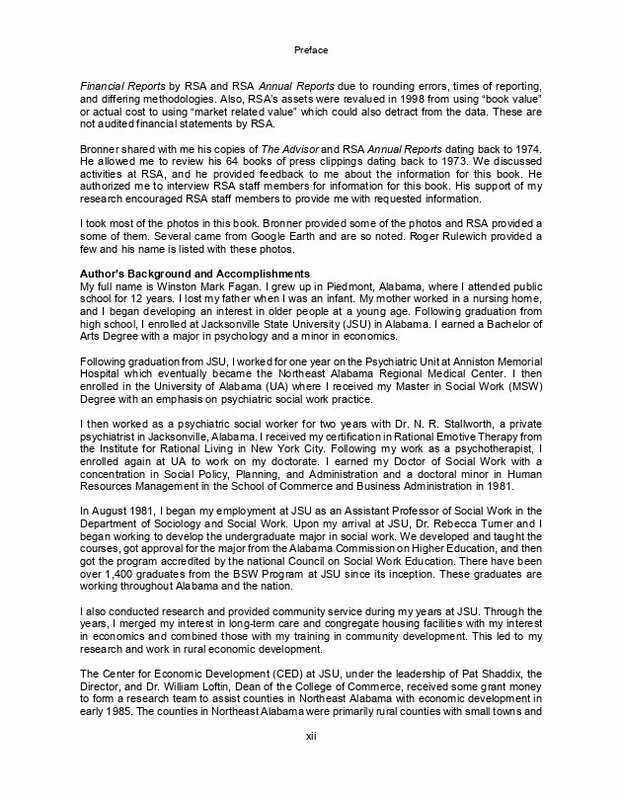 It serves as a memoir of Dr. David G. Bronner's activities at RSA and preserves these memories for Alabama history. 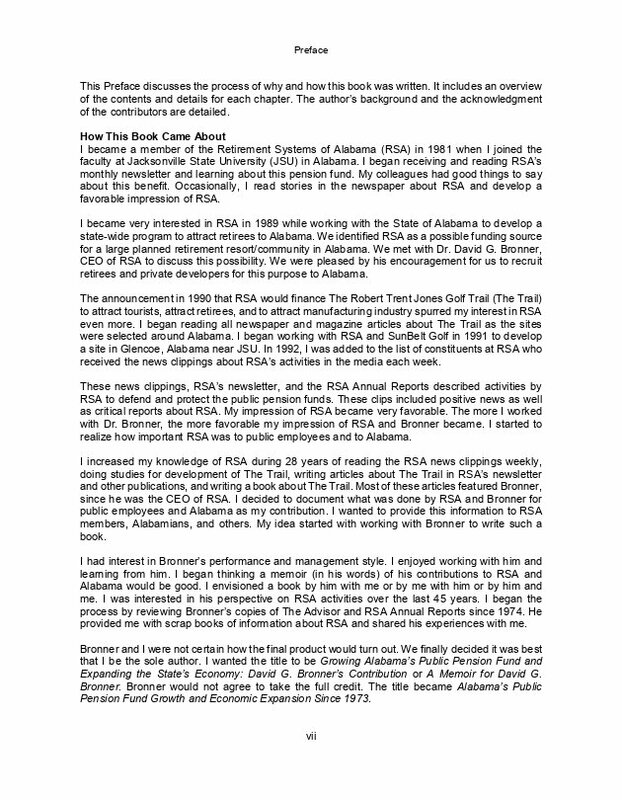 Details are given on how RSA diversified assets into billions of dollars in office buildings, golf courses, hotels, media companies, housing, and other commercial industries which stimulated Alabama’s economy, created higher paying jobs, and increased tax revenue. RSA played a role in almost every major industrial development project in Alabama since 1993 and assisted with financing for many of the corporations that developed plants in the state. RSA staff helped recruit corporations such as Mercedes-Benz and Airbus to set the foundation for the automotive and aerospace industries in Alabama. RSA developed a massive railcar assembly plant in Alabama and developed facilities for hosting Alabama’s Internet Exchange. RSA worked to develop Alabama companies in the chemical, wood pulp, steel, metals, maritime, and high-tech industries. Details are given on Alabama's economic expansion since 1973. 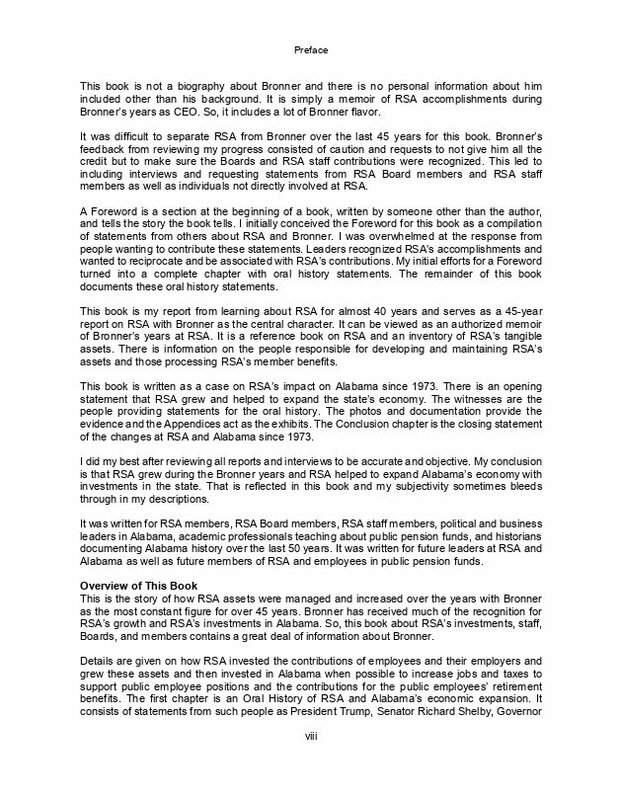 The basic information in this book was compiled from RSA newsletters, RSA reports, and news stories and interviews about RSA's activities over the last 45 years. 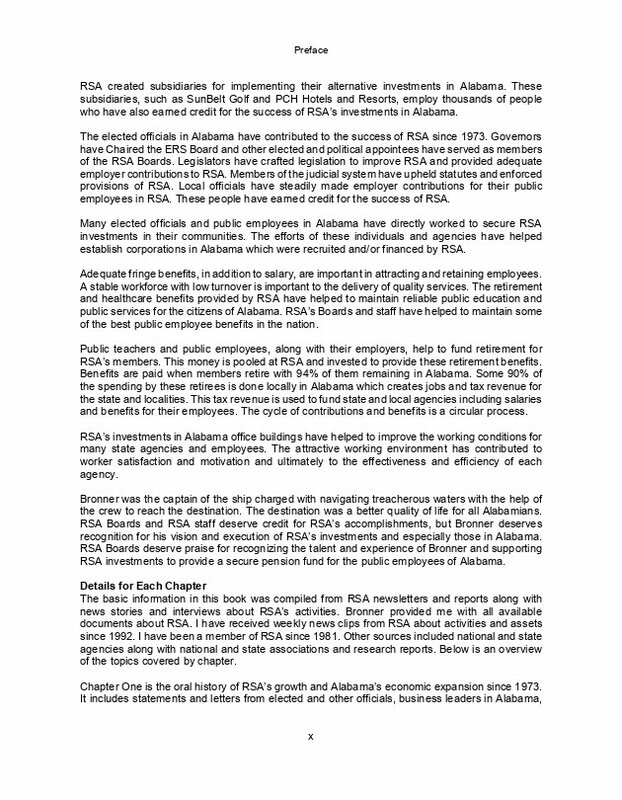 It was written for RSA members, RSA Board members, RSA staff members, political and business leaders in Alabama, academic professionals teaching about public pension funds, and historians documenting Alabama history over the last 50 years. It was written for future leaders at RSA and Alabama as well as future members of RSA. Mark Fagan earned his B.A. degree in psychology and economics at Alabama's Jacksonville State University (JSU) in 1974. He earned his masters' degree in psychiatric social work and his doctorate in social policy, planning, and administration with a doctoral minor in human resources management from the University of Alabama in 1981. He was certified in Rational Emotive Therapy from the Institute for Rational Living in New York City in 1978 and practiced psychotherapy from 1977-79. Most of his 134 publications and technical writings since 1981 have focused on the economic impact of retirees and retirement places. His publications are in the following categories: books-6; technical publications-48; newsletter/magazine articles-36; newspaper specials-8; technical white papers-6; agency publications-6; bound booklets-12; academic journals-4; websites-3; topic encyclopedias-3; and book chapters-2. 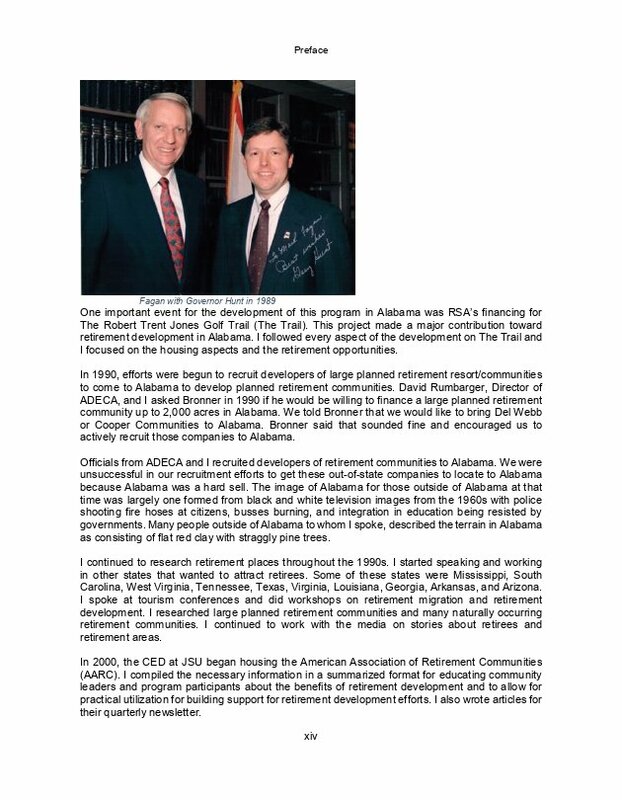 He has coordinated four Governor's Conferences, made 65 major presentations, and 103 minor presentations around Alabama and the nation about retirees and retirement. He has received publicity on 42 TV programs, in 91 magazines/periodicals, and 255 newspapers around the US. He has been consulted by and quoted in the national media for stories on retirees and retirement places. Some of the media where these stories appeared are The Golf Channel, CBS News, NBC News, CNN News, ABC News, "Good Morning America," U.S. News and World Report, Governing, Time, The AARP Bulletin, New Choices for Retirement Living, Where to Retire, Kiplinger's Personal Finance, Money, Business Week, Mature Outlook, Golf Digest, Smart Money, The Wall Street Journal, The New York Times, USA Today, The Christian Science Monitor, The Washington Post, Stars and Stripes, and National Public Radio. He has assisted RSA since 1992 with The Robert Trent Jones Golf Trail. This work included negotiations for 3 sites; projected economic impact studies for 5 sites and access roads for 4 sites; booklets on RSA's 2 resort communities; 19 articles; 11 professional presentations; 24 news stories; 10 TV programs; and 4 radio programs. In 2012, he retired as Professor/Department Head Emeritus from JSU after 31 years of service where he earned full professor status, taught 13 different courses, and served as Social Work Program Director and Department Head for Sociology and Social Work for 14 years. 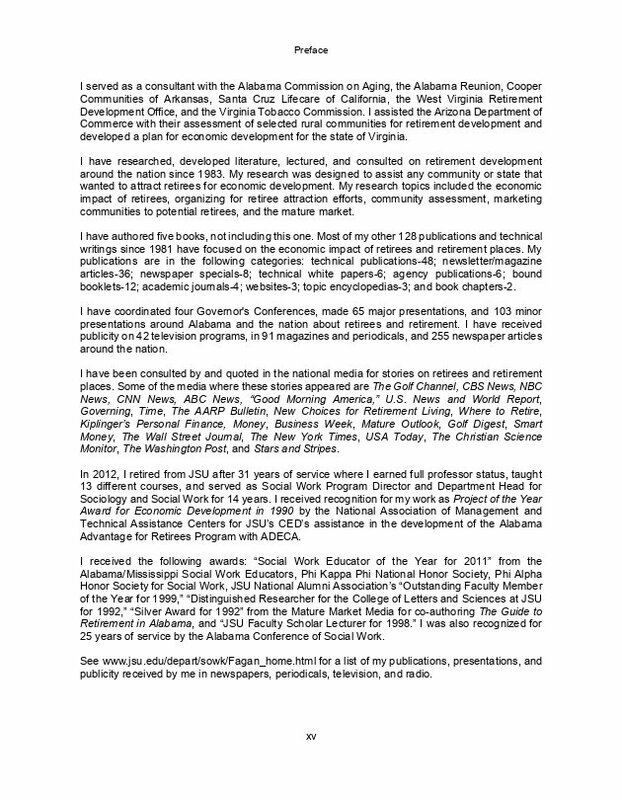 Dr. Fagan has been writing about economic impacts, economic history, and economic development for 35 years. He is the author of Attracting Retirees for Economic Development; Retirement Development: A How-To Guidebook; The Robert Trent Jones Golf Trail: Its History and Economic Impact; Coastal Alabama Retirement Guide; and Coastal Alabama Economic History.